Dear Mom: How Do You Find a Mentor? Every night I pass your room on the way to mine. It’s strange knowing that in a few weeks, that room will be an empty shell, left only with items that are part of your past. You are now officially an adult. I feel insanely lucky that I got to watch you grow up and be part of your journey. We raised you to be an independent person, to grow wings and fly. Now the time has come. On one hand, it is bittersweet, yet on the other, I am so excited for you to move into your own place and begin your adult life. I remember when I graduated from college. Your dad, whom I have now been with since our sophomore year in college (crazy! ), and I moved to New York City to start our adult life. We each had a job in hand before showing up in New York. I was to start in the Macy’s training program. It was different then. Every large company came to interview us on campus. People had fewer choices, and most of our friends all had jobs when we graduated. The knowledge of what you could do was limited by where you’d gone to college or how you grew up. Now, people have so many more options and actually know about all the opportunities out there. We graduated, went on an eight-week cross-country trip in a Toyota Celica, landed in New York, found an apartment, created a space that was ours, and began our next chapter. We felt excited, scared, thrilled, and uncertain all at the same time — just as I am sure you are feeling right now. You ask about how will you meet someone who will be a good mentor, and what makes them a good mentor. Mentors are important. But so are role models. Role models are not talked about as much as mentors, but the reality is that role models can make a bigger impact. As you embark upon your career, I want you to think about that first. Role models are people you can look up to, someone you might aspire to be like. Their impact can only be felt by you. They make you think about your internal goals — the things you might want to share with a mentor. I had a few women role models early in my career. The first woman I looked up to ran the store where I was a sales manager in Kings Plaza, Brooklyn. She was sharp and tough and commanded respect. I liked how she conducted herself as a straight shooter, and it was obvious that she was well-respected throughout the organization. She wasn’t so much a mentor, but someone I aspired to be like. The next woman I worked for was very similar, yet she took me under her wing. At this point, I was an assistant store manager for Macy’s in New Rochelle, and she ran the store. She gave me advice on how to look at the businesses I was running, how to manage the people who worked for me, and how to navigate the company (which was heavily dominated by men at the top), and she made sure I was taken care of after she got promoted. She wanted to pave the way for me, and that was empowering. She was a mentor for a short time but not for long. She moved up into the higher chains of command, out of New Rochelle and back to New York City. We didn’t have email then, or texting, and people didn’t stay in touch like they do today. After she got promoted, someone else came in to fill her role. He was great to work for, but it had been unique working for a woman who was not only a role model but a mentor at the same time — particularly when there were fewer women at the top and more women at the bottom. Being able to learn from a woman at the top who really cared about my success was a gift. There was another woman I worked for who was a terrible person. She was mean, she couldn’t have cared less if I succeeded, and she was selfish and not my advocate. She was an “anti-role model” — she showed me what not to be. The only reason I stuck it out for a year was because I was learning about the back end of the manufacturing business, and I knew that was invaluable. I kept my head down, listened, and figured out how to grow my own business inside hers. She never gave me advice, she never taught me one thing, she never even asked how my weekend was. She did not have one social grace. It was like working for a cold tyrant. I was so miserable and stressed that the whole experience took a toll on my face. I developed adult acne. Nobody should have to go through that. I tell you all three of these stories because each impacted me along my journey. I was able to work under women that I respected and others that I did not. It helped me become the person I wanted to be — not only in my career, but in my life. They were all role models, some good and some bad. Mentorship is a word that is tossed around a lot these days. It wasn’t something that people talked about when I started my career. There is this belief that one of the things that you must do when you begin your career is find a mentor. I don’t agree. If people want true one-on-one guidance to help them navigate the world, they should find a good shrink, just like most entrepreneurs see a coach as their business starts to take off. I am a huge fan of that. It can helps people get rid of personal baggage and become better leaders. Mentorship is different. It is something that should happen organically, with someone who finds an interest in you as much as you find an interest in them. A mentor can be someone older and wiser, or occasionally, it can even be a peer. If you find someone who is older, who you really enjoyed talking to and getting advice, then shoot them an email afterwards and thank them. Begin to engage them by asking their advice on something else that comes along. If it feels natural, then ask if you can get on their calendar for lunch or coffee. It is just like building a friendship. As for your peer, it might be someone in the same industry as you. You start to build a new friendship or have lunch or coffee during the week. That relationship is built around career talk. Generally peer mentorship goes both ways, which is invaluable, because you are going through the same thing together and can rely on each other for advice. Later in your career you may even find mentorship from someone younger than you. I see people now who are older but want some transparency into how to code, or into how new technologies work. Younger people can help. A mentor is someone who can help you think through the stumbling blocks along the way. Someone who can also be your cheerleader. Someone who wants to see you succeed. Someone who is happy to analyze situations with you and give you advice to get to the other side. Someone who has opened the door to you to begin a friendship around your career. Sometimes that person reveals themselves to you over time, and then all of a sudden you realize that they are your mentor. It makes them feel as great about giving advice as you feel about getting it. There is a woman you met recently, in Los Angeles, whom I met later on at a party. She thought you were amazing. She said to me, “I want to hang with Emily.” You liked her, too. She has had an interesting career. She is 15 years older than you. If you emailed her and asked her for some advice through this process of finding a job, she would probably be thrilled to do it. When you start to talk to a company more seriously about taking a job, just ask her if you could get on her calendar for a phone call and say you’d love some advice and wonder if she’d be willing to give you some. You are trying to make some decisions, you really enjoyed talking to her when you met, and was hoping she’d be willing to take some time out to talk again. She could become your mentor without you realizing it. That is how it should happen — organically. If she said she is super busy right now, that is OK. Then she is not your person. I have always been open to helping others think about their careers. As an angel investor in over 85 companies and counting — where 75 percent of the entrepreneurs are women — I have become a mentor to every person I invest in. I am closer to some than others, yet I make myself available to every one of them and let them know I am there to support them. These relationships did not happen organically, but I work to make sure they know that they can call on me anytime. There is one woman whom I consider myself a mentor to, and I consider her just as much a mentor to me. She reads my blog. That is how we met. She emailed me asking for some advice about her career. I emailed her back. She took the advice and it paid off. She emailed me letting me know. I was thrilled for her. She wanted to meet for lunch, so we did. 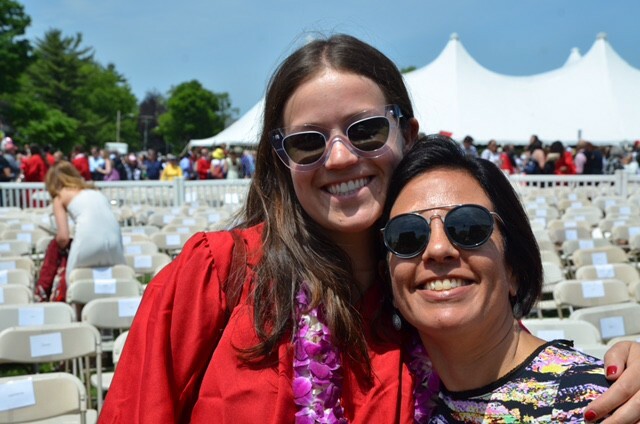 Over the years, not only have I have met with her, given her advice on how to negotiate a raise over two days of an email exchange, helped her to think about her future, and applauded her successes, but we have become friends. She has taught me a thing or two about the business she is in as well, and that makes for a great relationship. You have great insights about people. You will know when to connect with that right person to help you on your journey. You will know who’s a good role model and who’s not. I am confident that you will find your own path and surround yourself with good, smart, caring people. I am your mentor for life, and hopefully a role model too. I can’t think of anyone else I’d rather be a mentor to, except, of course, your brother and sister.